Trading and Investing Nifty Valuations: Over Valued or Fair? Nifty Valuations: Over Valued or Fair? For starters, the market in no way is undervalued. Some stocks might be but the market as such is definitely not. What remains to be answered is wether the market is fairly valued or over valued? Last time we had written a similar article in January 2016, the index was close to 7963 levels and the EPS was 369. The P/E was 21.5 which showed a 5.5% drop on YoY basis. The current scenario, Nifty is trading at a P/E of 21.56, EPS of 364.12 and P/B.V of 3.32 and Dividend Yield of 1.42%. The last 5 years PE Chart shows that we are again near an unsustainable territory as per PE valuations. The earnings are not picking up to justify this valuation. The market is high on expectations and the results are really not showing improvements. This does not mean that a crash is coming tomorrow itself, the market can trade at high PE levels for months consistently with no real correction. The average PE is around 18.5 and this is considered a fair valuation level. It is tough to define fair valuations when there is no earnings growth itself. For a PE of 20+ there should be a 15% growth atleast in earnings. This trend is however negative. Going ahead, one day the institutions will wake up to a harsh reality of realization that earnings growth is not coming in. They'll start shifting their money to other asset classes and thus we'll see a significant downside (If earnings growth doesn't improve). This is our view in the current scenario. What does it mean for your portfolio? 3. When NIFTY P/E is between 20-22 and you have a 1 year view. The above table just gives a general view. A well balanced portfolio will consist of both equities and debt. Nifty might be overvalued but there are good midcaps which might be growing at 20% p.a. and clean balance sheets but trading at P/E of 10. Isn't it worth investing? Portfolio allocation and stock selection should change as per market valuations. We employ this belief in our Investment Advisory Services and this will definitely reap benefits over the long term. 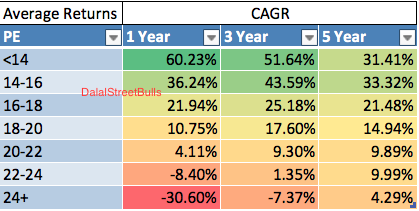 No portfolio is recession proof, but what does the C.A.G.R show over years is important. At present, our clients have majority funds deployed in debt funds. Buy right, sit tight. This saying comes with lots of terms and conditions, PE Valuations are surely one of them. Do share on WhatsApp and Facebook!